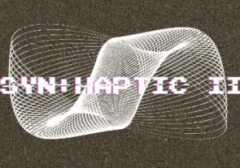 We are excited to invite you to a new Syn:haptic ! For this edition, we celebrate the come-back on stage of Aaron Noseday aka Axhan Sonn who has just released a new EP on the Belgian label Narcosis and the very first live act of the producer Datawave, an absolute coup de coeur and creative talent in the electro scene. Following the live acts, we are super glad to invite Sexperimental and Theo Marin aka Krasius (bubbles time for his Bday!) who will drop their favorite vinyls and tunes that they don't play that often ! Mysterious project from Belgium, Axhan is a talented young artist who explored the wide electronic music spectrum since his earliest childhood. Learning from this rich background and working his DJ and composing technique since his teenage, Axhan's music ranges from complex ambient textures to solid rhythmics, often mixing both in a daring way. His few public appearances never miss to bring the words "striking" and "original" together on a same level. Expect some new material ! Brussels-based electro enthousiast, Gaetan got his first influences in the early 2000's from local radio shows and various underground parties. Few years later he started deejaying, then composing his own sounds. The pleasure of creating music, and particularly electro, grew more and more by the years, which led to the beginning of his Datawave project around 2010. He released his first EP on the very respectful electro label Crobot Muzik (owned by N-Ter) last year and a couple of splendid tracks on Natural Sciences. Not to be missed !